The market will literally pay us a small premium to take their money and keep it safe for them for five, seven or 10 years. We could use that money to rebuild our roads and water filtration systems. We could use that money to cut taxes for any business that adds to its payrolls. We could use that to hire back the 600,000 state and local workers we’ve laid off in the last few years. The US never pays down debt. Except for a short period in the 1990's when we paid a tiny chunk off, all we do is roll over the old debt and pile more on top. We are still rolling over most of the debt we incurred in World War II. So any new debt we take on will likely still be around fifty years from now. As a result, taking on debt based on current low rates is exactly equivalent to a cash-strapped family taking on more debt because they got a low teaser rate on a new credit card. Eventually the rates go back up on the debt. Just because interest rates are low does not mean that somehow the spending is free. In the private sector, companies take on debt in expectation of growing revenues enough to pay the debt back. How is hiring 600,000 state bureaucrats going to help pay off the new debt in 10 years? The implication here is that all current government spending is so awesome that when we drew the line to mark the budget, additional totally awesome spending got left out, so if we just had more money, there are still lots of great projects available to spend the money on. Really? Where was all the catch-up road maintenance and water filtration systems in the last trillion dollar stimulus debt-binge? Seriously, the Left had their trillion dollar opportunity to prove out some value here and coughed up a hairball. So now they want a do-over? This is yet another great bait-and-switch: They say its for water filtration and roads, but it ends up just being to maintain do-nothing government jobs with above market pay and benefits, largely in exchange for these folks voting Democrat. Here is the ultimate irony -- certain countries are getting negative interest rates (Switzerland comes to mind right now) in government bond auctions because they are considered safe in comparison to a number of countries that are floundering. They are considered safe because investors think they are less likely to do fiscally stupid stuff like what is done in Greece in Spain -- say, for example, borrowing a bunch of money when the country is already deeply in debt to rehire at above market salaries 600,000 unneeded government workers. Klein is saying, basically, since interest rates are low, lets go indulge ourselves in all the actions that tend to drive interest rates for government way up. I'm convinced people have completely forgotten about the P part of P&I payments. Way too much focus on the interest rate and none on the wisdom of incurring debt in the first place. I understand the argument about how impossible it is to default when you control the currency, but as you suggest, the P part is still there and needs to be rolled at the then-prevailing rates (gosh do yah think they might be higher?) or inflated into a smaller real amount. Both options hurt. Spending it on tax cuts might generate a net-positive return. For that matter, some of Professor Summers' ideas might even work out the way he thinks they will, although I'm skeptical about the overall return on the full package. But rehiring government employees? Forget about it. And even if we weren't already thousands of miles into the Land of Diminishing Returns on road construction, we can't figure out how to get around to spending most of the money we've _already_ budgeted for that. Ezra Klein says something else stupid: News at 11. I remember in 8th Grade History ~1981 there was a salary negotiation going on, and our History teacher, who didn't hide is leftward positions in class, told us all. The school board is lying. Of course they can give us higher salaries, all they have to do is sell Bonds! Even in 8th grade, having been brainwashed by these folks for 9 years, I knew there was something wildly wrong with that statement. @Matt borrowing for tax cuts is dubious too. It means that the money has to go twice through our hands before it gets to the people who can lend, and of course government will take 30% on the top of the first cut. Also people tend to react to long term tax incentive, not short term. You think we could keep up that borrowing for 10+ years? This plan would make a lot of sense if the US government were cash-flow positive over a substantial period, and all borrowing was going to fund capital projects with lifetimes equal to or longer than the maturity of the debt. However, since most government debt is used to finance transfer payments which do not produce the equvilent of an asset on the balance sheet, raising government debt now is a net loss on the economy over time. You've got banks taking zero lending risk and instead snapping up UST, and apparently some furious bidders for "risk free" (LOL) collateral. This is about the worst possible liquidity and monetary configuration you can construct, short of outright bank nationalization and full on government financial control. Klein manages to pack so many bad ideas in so little space! This is really good, Coyote. I've been seeing a lot of this in my blogroll and never really thought about challenging it. It's good that someone conservative is actually reading and interacting with these people, that's where the persuasion happens. Borrowing money is stupid, unless it is fully collateralized, such as a home mortgage, If one borrows money to live beyong one's means this month, it must be paid back with interest later. Over a period of time, there is less to spend because of interest payments. When interest rates go back to normal (4-6%), the interest on the US debt will approach a trillion dollars per year. If we were not in debt, that money could be devoted to something useful. The financial gurus seem to beleive that by shuffling money from one account to another (US buying its own bonds) we can perpetuate spending money we don't have. We are trying to violate the first law of thermodynamics: Taking out more than we put in. Instant wealth via paper shuffling. What f------- nonsense. We will get what we deserve for such folly. Warren, you're a very smart guy and what you wrote makes sense based on your assumptions, but I think you've got some of those wrong. The government isn't analogous to a family, one is revenue constrained and the other isn't, so thinking about what makes sense for a family won't lead to the right answer. A currency issuing (Japan, the US, not Spain or Greece) government's constraint is inflation and the real economy, not money. They can't run out of dollars, but the country can run out of steel. 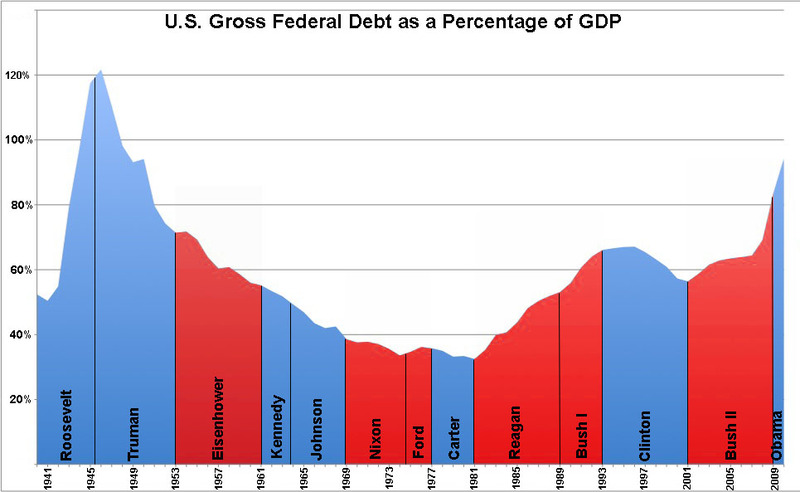 Think about where the dollars the government is 'borrowing' come from. They can only come from the government, who else could have created them? Imagine if the government started doing something that makes sense for a family, actually saving and having a nice 10% surplus every year. That would mean that dollars are being destroyed and eventually the private sector would run out of them. It's simple logic- if dollars can only come from one place and the government is removing dollars from the economy, then the overall level of dollars will go down. Or another way to think about it is if you founded a colony on the moon and decided to use moon-bucks. At first nobody would have any so the government would have to deficit spend- deficit spending is a prerequisite for a currency! You can also follow the logic for how a government would create demand for moon-bucks- say you could only pay for air with them.... it's the equivalent of taxes in our system. The math is such that the government needs to run a deficit so that the private sector can save at all. The politics of how that deficit is run are important as you point out above (I'd prefer a full suspension of the payroll tax, than a bunch of meaningless bridges), but the government does need to run a deficit and when the private sector wants to save (or pay down debt) more quickly it needs to run a larger one. well, you know how you occasionally complain about how little help you get complying with stupid laws? Maybe if there were more people to do that work companies could get permits processed faster. They say its for water filtration and roads, but it ends up just being to maintain do-nothing government jobs with above market pay and benefits, largely in exchange for these folks voting Democrat. Have you looked at the wage compairison studies that hold constant for education and experience? Long story short, the janitor makes more, the engineer makes less than market rate. Coyote: The US never pays down debt. Except for a short period in the 1990′s when we paid a tiny chunk off, all we do is roll over the old debt and pile more on top. As a percentage of GDP, the U.S. has often reduced its debt load. It is reasonable to take on debt during downturns or emergencies, as long as the debt is paid down during the good times. That's NOT the same as paying down the debt. Two entities that possess the same amount of debt $X but have wildly different incomes still possess the same amount of debt. We could talk about nominal vs real value of that $X, but that's not really what you're talking about here. Taking on more debt during an emergency or downturn would make sense if you could show that the money would go to something that alleviates the emergency or downturn. Certainly Keynesians will argue that this is the case here, obviously, many of us don't buy that. Looks like Marc Zuckerberg is taking on debt for his Palo Alto home. 5.9 million @ 1.05%. It is an instantaneous loan, so as soon as libor goes up, it will too, but that won't happen for 3-4 years and then he has the money to pay back the 5.9 million pretty quickly. He is getting the loan below inflation so he is technically making money. Seems petty though, when he is a billionaire to do something that saves himself maybe 60K a year. >>>> How is hiring 600,000 state bureaucrats going to help pay off the new debt in 10 years? By the time that 10 years have passed, the 30% inflation rate -- greatly assisted by the addition of the money to pay those 600k civil maste///// (sorry) "servants" -- will effectively mean that those investors will be paying us just to borrow their money. Welcome to the world of gummint finances. >>>>> Klein manages to pack so many bad ideas in so little space! One of the primary benefits of the single-cell brain. >>> We will get what we deserve for such folly. No. None of US deserve this crap... but we'll get the shaft for it, regardless, along with those who do. And you can bet the lynch mobs are going to be held at bay, too, so they most posdef won't be getting what they deserve. Oh, sure it does! GIGO always works!! That the end-product is being selected by people who don't know sh** from shinola is the main issue.